Ada pertanyaan untuk Sand Sea Resort? Direnovasi pada tahun 2012, Sand Sea Resort menjamin pengalaman menginap yang menyenangkan bagi para tamu di Krabi, baik untuk tujuan bisnis maupun plesir. Kehebohan pusat kota terletak hanya 18. Km dari sini. Pantai Railay, Real Rocks Climbing School & Shop, Pantai Phra Nang dapat dicapai dengan mudah. Sand Sea Resort menawarkan pelayanan sempurna dan segala fasilitas penting untuk memanjakan para wisatawan. Properti ini menyediakan WiFi gratis di semua kamar, satpam 24 jam, toko serbaguna, layanan kebersihan harian, toko oleh-oleh/cinderamata untuk menjamin kenyamanan terbaik. 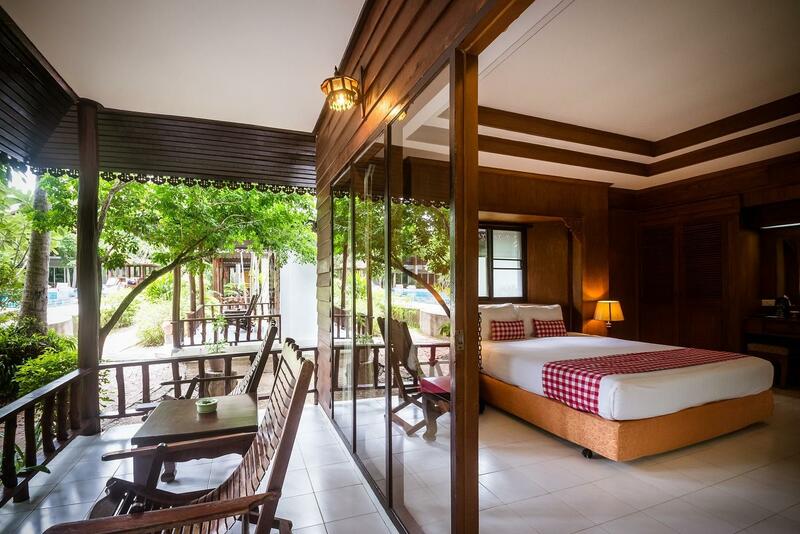 Sand Sea Resort memiliki 123 kamar yang semuanya dirancang dengan cita rasa tinggi. Banyak di antaranya memberikan kenyamanan seperti televisi layar datar, ruang keluarga terpisah, akses internet - WiFi, akses internet WiFi (gratis), bak mandi whirlpool. Properti memiliki berbagai pilihan fasilitas rekreasi yang memungkinkan Anda melakukan bermacam hal selama menginap. 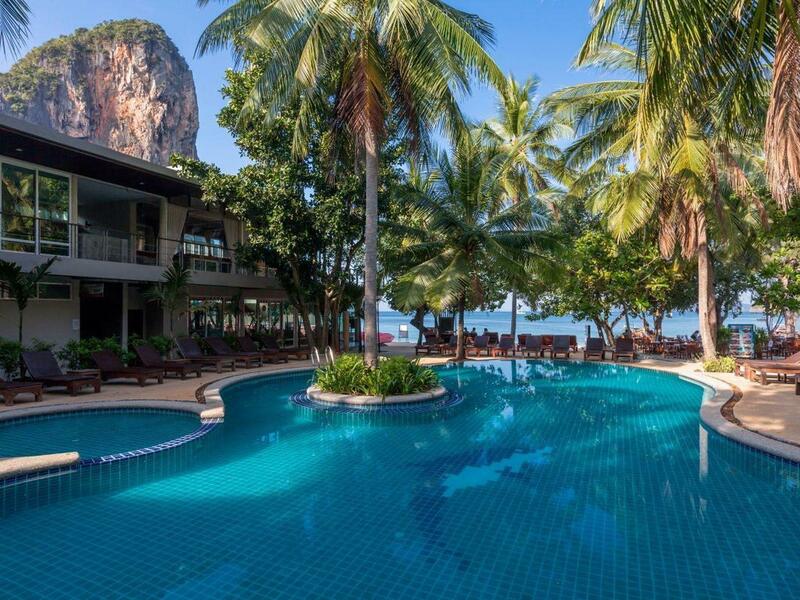 Fasilitas super dan lokasi yang istimewa menjadikan Sand Sea Resort tempat yang sempurna untuk menginap di Krabi. Properti tidak menyediakan minuman beralkohol. Tempat tidur bayi tersedia gratis untuk anak berusia 0 hingga 4 tahun. Anak usia 5-11 tahun dikenakan biaya sebesar THB 175 untuk sarapan apabila menggunakan tempat tidur yang tersedia. Biaya sarapan bisa dibayar saat check-out. Anak usia 5-11 tahun dikenakan biaya sebesar THB 900 termasuk tempat tidur tambahan. Biaya tambahan bisa dibayar saat check-out. Fantastic hotel and location with very friendly staff! Though you can't reach the resort directly by road (No resorts on Railay beach can be accessed directly by road from Krabi mainland), you can enjoy a really good time here on the lovely beaches of Railay. The resort is just on the Railay West beach. Easily accessible from Railay East beach and Pier. You can also well spend your time on the Phra Nang beach. Rock climbing, canoeing, sun bathing, Island hopping are common activities you can find here. The staffs here are very caring and supportive. The resort has two pools, which are also great. neat and clean place to relax. They have very interesting and comfortable transport service from Krabi Airport to resort and vice versa. Their front desk is also very supportive. I mistakenly done booking for only two adults. They later accommodated my two kids with extra bed and necessary breakfast option with reasonable charges. I would recommend others to have their stay at Sand Sea resort while in Krabi. Lovely rooms, great location. Food average and breakfast poor quality and service. Should make it clear on their website this a no alcohol resort. No major problem but I’d have liked to have sipped a cocktail while watching the sun go down. Overall it was acceptable, but this establishment can do much better! It was a great stay at sand sea. The hotel is strategically located just right next to the beach. Other than the ants that were in the room, everything was fine. Hotel staff were courteous and helpful. Would definitely come back for my next trip. The hotel is in a great location away from the bustling town and the beach is facing the sunset. However everything is poorly maintained including services were inconsistent. There were some staff at the restaurant quite arrogant and unhelpful while the rest (most) of staff kind and helpful. The room was spacious but not in its best condition. The wall lights at the bed mysteriously disappeared leaving holes on the wall and the hot water was hard to keep at the right temperature. While overall I believe the resort has a fair value for money, I’d happily pay more to get a better holiday experience after all, given the long distance I have traveled to get here. Basically I’d not come back to this resort again. Friendly, helpful staff, jaw dropping location/scenery, comfortable, clean, cool and very quiet. It was perfect, and we would definitely consider staying here again. We loved our huge room and balcony. Can't do much better in Railay at this price point, I would recommend over Princess which was where we spent the other half of our trip. 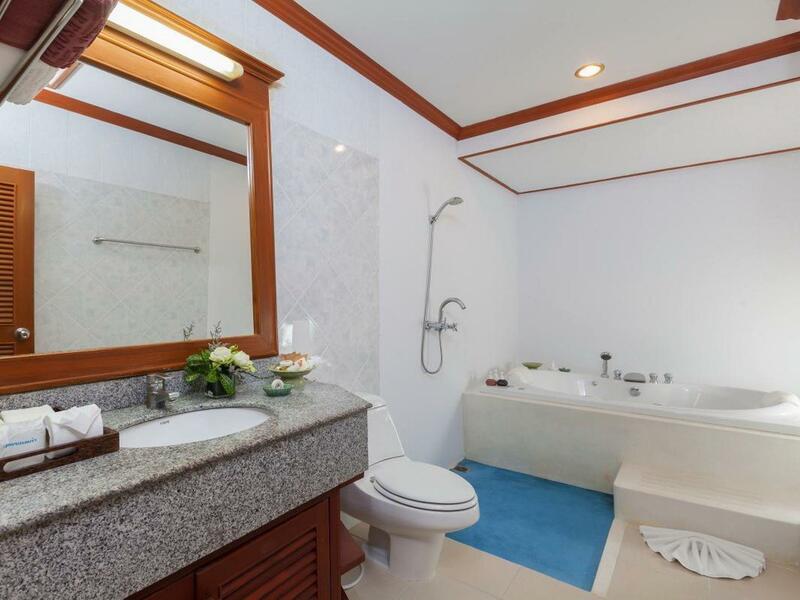 The rooms are very modern and clean. Beautiful balcony to sit and relax on with a book. The room was very very spacious and the location was perfect. We would absolutely stay here again. Not too bad at all. Very comfortable. The first good buffet breakfast I've had in years of travel. Thank you very much to stay with us. We're appreciate your feedback and hope fully to cane welcome you again next time. This was my second stay at Sand Sea Resort. 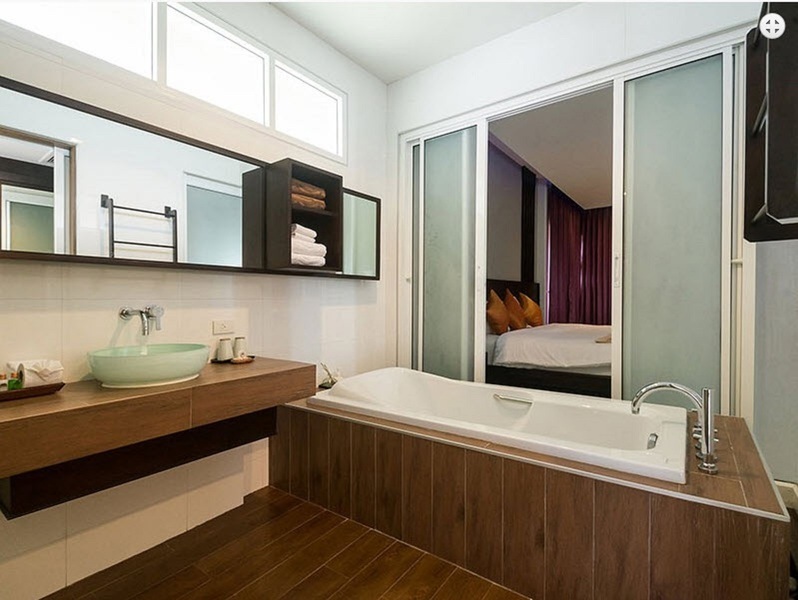 Rooms are spacious and very clean, especially good that both bathtubs and showers are available. WiFi is not really strong, but I was on vacation, good enough to read the news. The fine, sandy beach is about 20 meters from the room, and restaurants are no more than 100 meters away. Breakfast is a must - 350/person if not included in your room. Huge buffet, for all nationalities. We pretty much had a breakfast in the morning and were set for the day until very late night. All around good experience, for the second time, would recommend to anyone. Excellent location on the west Railay beach. The hotel does not sell alcohol, but this is not a problem as there are a few bars just a couple of minutes away. Staff were very accommodating when we asked to change rooms due to noisy neighbours. Beautiful place right on the beach. If you come to Railay, you want to be staying right on the beach. The area, Railay, was awesome. The hotel itself was great. No issues whatsoever. Two pools were great for cooling off and enjoying the view after a day of activities. However, the resort is only accessible by boat and boats only operate during day. You can reserve a boat from the resort for a fee or you can book at the beach. Overall a remarkable experience. Would come again and again. This was our last island we visited before heading back to Bangkok and was one of my favorites. The hotel is literally right on the beach and when you get to land it took us one second to walk to the front desk. Beautiful views for sunrise and sunset. We did the buffet that I believe is included in most stays and it was average. At this point we were pretty independent with findings things so we didn't have many interactions with the front besides checking in and out. I would love to stay on this island for a week but we had a couple days. Just beautiful! Pros: location right on west beach, 2 pools one (one by the beach one quieter in the back), breakfast was great (many options that rotate each day), rooms were nice and clean with comfortable porches. This resort was well worth the price since it was at the same time right in the middle of everything but somehow also quiet. Cons: you can find better, cheaper food and much cheaper massages and spa treatments elsewhere. If you each and get massages somewhere else you will definitely enjoy your stay here. We stayed in the resort for 5 nights - 3 in the bungalows with view to the pool, and 2 in the King deluxe room. The bungalows were nice and clean, however very simple, especially the shower which probably could fit a plain hostel better than this resort. We really liked the view from the porch. The King deluxe room, however, costs only a bit more and was way better. Staff at reception were unkind and unhelpful, in oppose to the cleaning staff which were very nice. I like the resort and go back again and again because of the really charming houses, the nice, friendly and helpful staff, the really rich breakfast buffert, the nice little beach in front of the resort, the possibility to walk to the other side of the peninsula and to see other beaches, restaurants and bars, the really phantastic surrounding with the high cliffs around - and the wonderful day trips you can make with the speed boats into the blue sea. 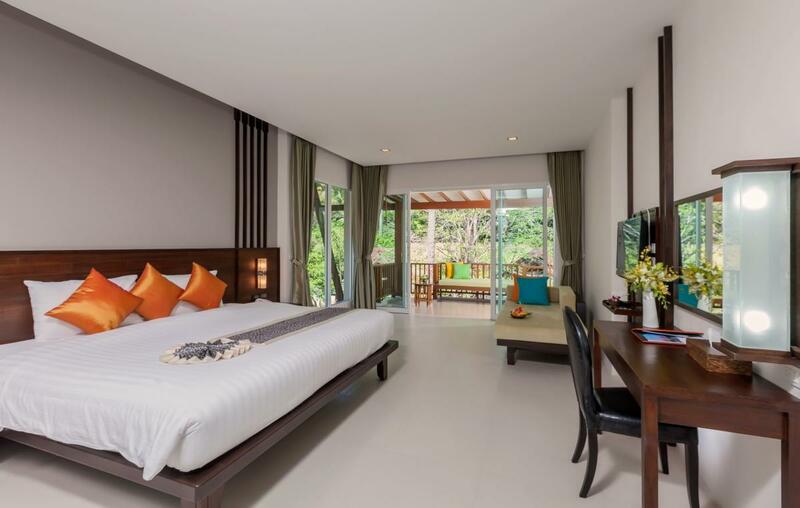 this hotel is in the perfect location of krabi, railay west. it's right by the beach of railay bay a secluded area that you can ony reach by boat from different locations. water is calm and clean beach is perfet, wonderful sunset! we stayed 3 days and never felt like we were stuck at this bay because you can organize things to do. from kayakin (200 bhat 1 hr) half day cliff climbing (1000 bhat half day) island hopping all day (3200 by private boat). restaurant is great with huge variaty, breakfast is not good by western standard at least. our cottge room was spacious, bright and super clean with a patio outside. all in all i would definetely go back. please note that if you book a hotel on railay east you will not have the beach and you will have to walk to railay west.